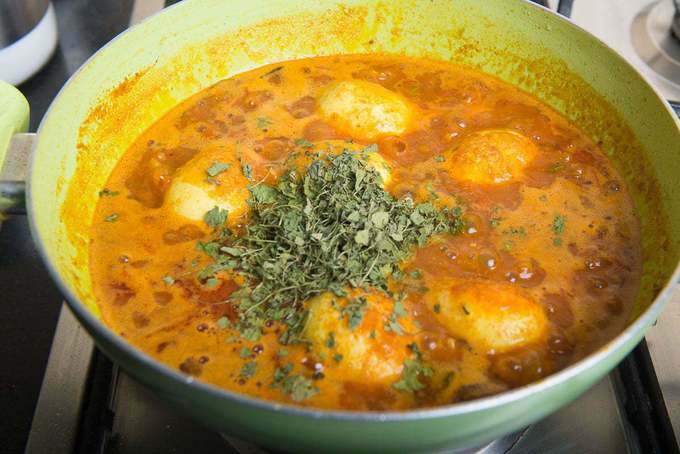 Egg Curry Recipe or Anda Curry is a spicy Onion tomato based Indian egg curry which goes very well with any Indian Bread. Here is how to make this masala egg curry recipe (Step by Step + Video). Masala Egg Curry or Anda Curry as it’s popularly known in India is delicious thick tomato gravy with the addition of eggs that acts as the perfect accompaniment to compliment your lunch or dinner. This Indian Masala Egg Curry Recipe goes well with tawa roti and Paratha, you could also eat it with any rice dish. What I like most about this egg curry is the medley of flavours and how the flavours soak into the egg as well, making it a delightful dish. You may have tasted this Egg Masala Curry at any of the Punjabi dhabas where it’s popularly served with lovely flaky parathas. Don’t worry, this recipe is really simple to make and it’ll taste just as great. This egg curry is beaming with flavours but it’s not too spicy, so it’s great for kids too. Some of the other Punjabi recipes I’ve posted are: Punjabi Lobia Masala, Punjabi Wadi Chawal, Punjabi Panjiri, Punjabi Rajma Masala, and a divine Punjabi Sarson ka Saag. How to prepare Egg Curry? To make this Punjabi style egg curry, first eggs are boiled and peeled, after which it is pricked with the fork all over so that the flavours of the masala seep right in. 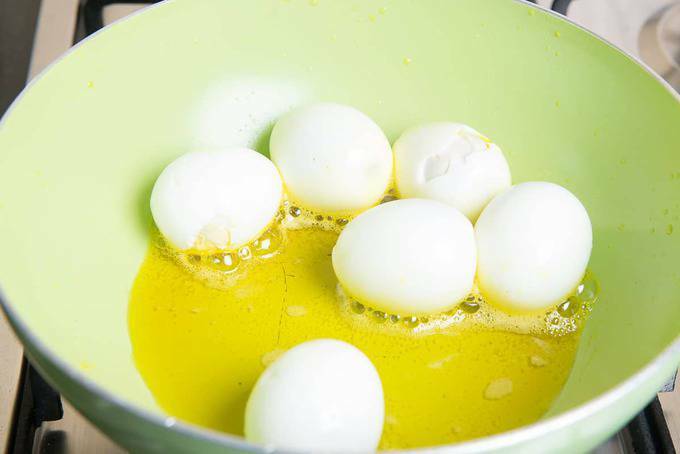 Then some mustard oil is heated in a pan and the peeled and boiled eggs are shallow fried until it’s browned from all sides. While frying, it’s best to cover the pan in order to prevent any oil spills. The eggs are taken out and transferred onto a plate. 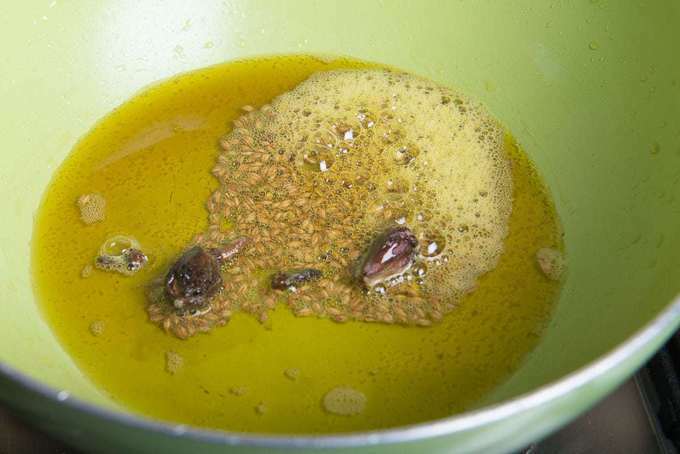 Next to make the egg curry gravy, some more mustard oil is heated in a pan and to this cumin seeds, cloves, and black cardamom are added and allowed to crackle for a few seconds. 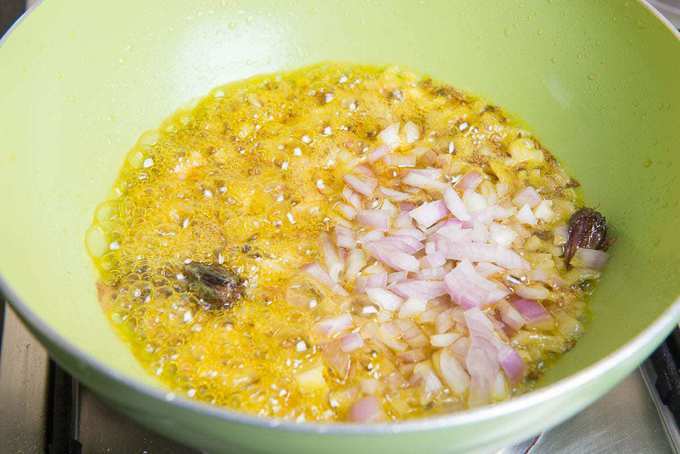 To this spice mix, chopped onions are added and fried till golden brown, followed by the addition of chopped ginger and garlic. Then tomato and tomato puree are added and cooked for a few minutes. To this, dry spices are added and cooked for a few minutes. Depending on the consistency of the gravy, you can add some water if it’s too thick. Then the boiled eggs are added with two cups of water and the gravy is allowed to boil and cook for a few more minutes. My husband makes a delicious variation of this egg curry which is a mix between a curry and Shakshuka and his recipe is world famous 🙂 Trust me guys, he has made it in many countries he has visited for his friends and colleagues and they have all loved it, hence world famous ;). 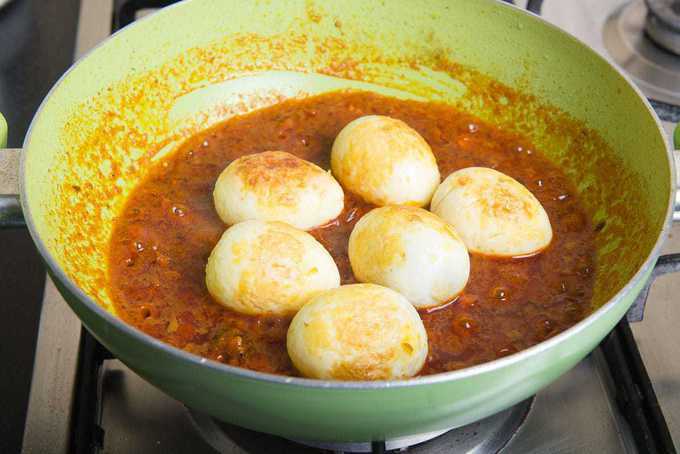 To make his style egg curry, just fry the masala as mentioned below in the recipe. Just make sure to do it in a shallow pan. 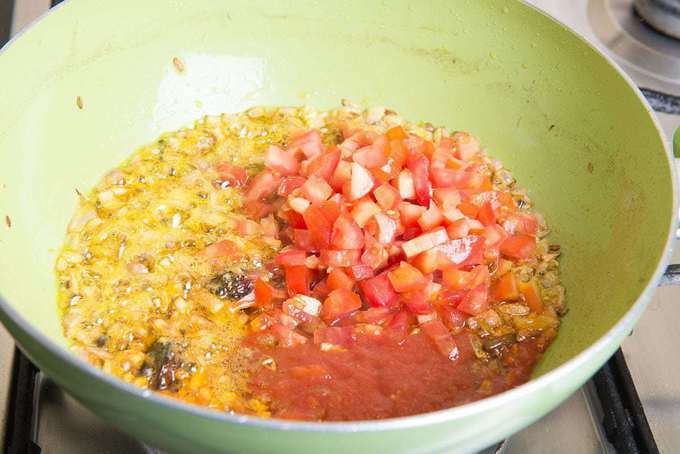 Now instead of adding boiled and fried eggs in the masala, break the eggs over the masala and cover the pan with a lid. Cook on low heat until the eggs are cooked through. Garnish with loads of coriander and serve with roti. 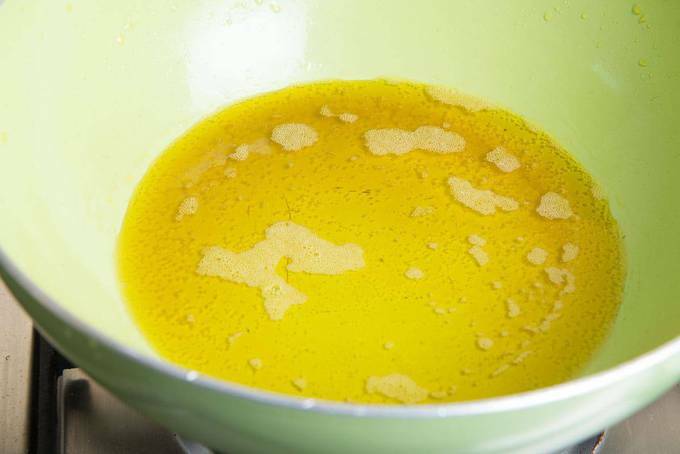 The gravy in this recipe should be medium thick before adding the eggs and not too watery. What to serve this Egg Curry with? 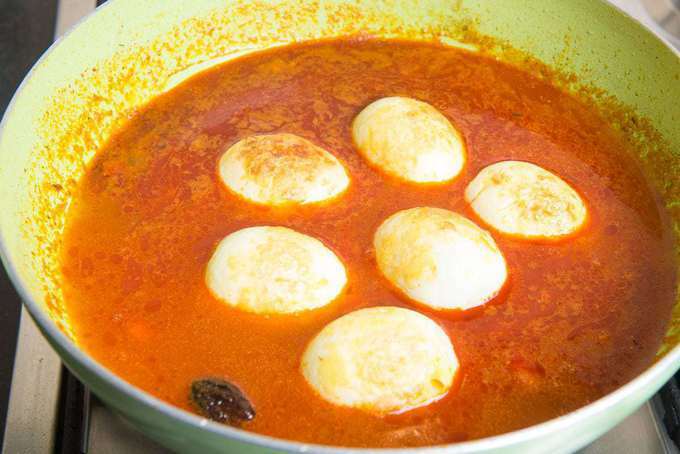 You can pair this egg curry recipe with jeera rice or lachcha paratha. It goes very well with Phulka too. 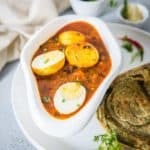 Apart from this Dhaba Style Punjabi Egg Curry Recipe, you can also try South Indian Kerala Style Egg Curry, Chettinad Egg Curry or even Bengali Egg Curry. 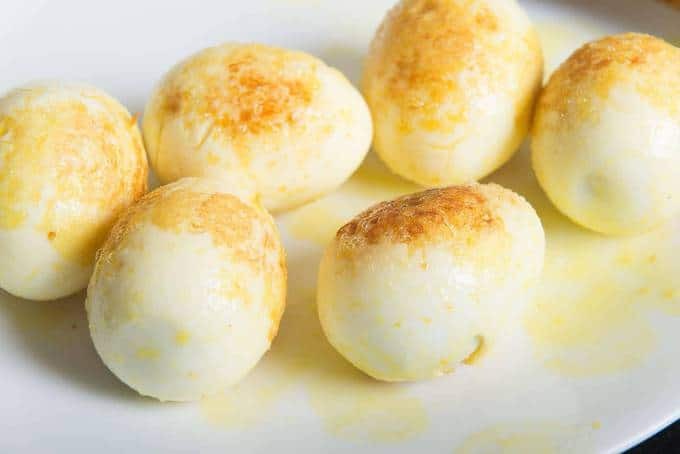 Peel the boiled eggs and prick them with a fork all over. Heat 2 tbsp mustard oil in a pan. Shallow fry the eggs until they are browned from all sides. I like to cover the pan while eggs are frying to avoid any oil spills. Take out the eggs in a plate. Add cumin seeds, cloves and black cardamom and let them crackle for a few seconds. Now add ginger and garlic and fry until onions are nicely browned. 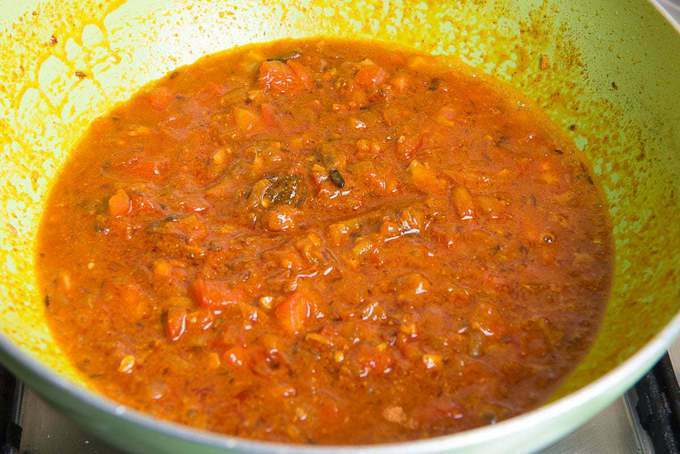 Add tomato and tomato puree and cook for 3-4 minutes. Next up, add coriander powder, red chilli powder, turmeric powder, garam masala powder and salt and cook for 3-4 minutes. Add some water if the masala is too dry. Finally add the boiled eggs and 2 cups of water and bring the gravy to a boil. Simmer the heat and cook for 5-6 minutes. Add kasuri methi and lemon juice and mix well. Garnish with fresh coriander. Serve hot with tava roti or paratha. Egg Curry Masala, Egg Masala Curry or Anda Curry is a spicy Onion tomato based Indian curry which goes very well with any Indian Bread. Peel the boiled eggs and prick them with a fork all over. Heat 2 tbsp mustard oil in a pan. Shallow fry the eggs until they are browned from all sides. I like to cover the pan while eggs are frying to avoid any oil spills. Take out the eggs in a plate. 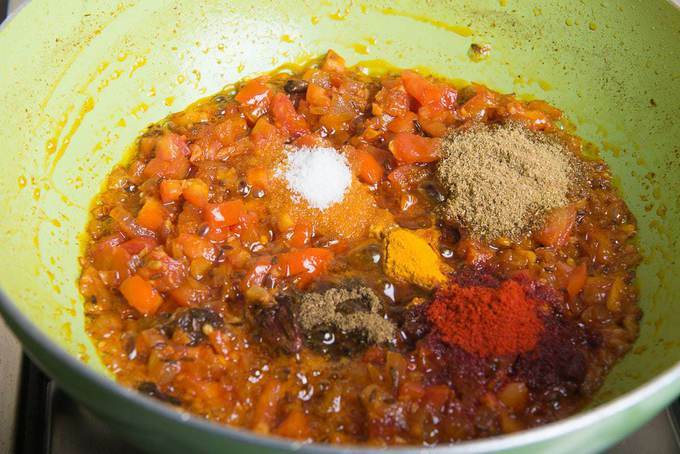 Add coriander powder, re chilli powder, turmeric powder, garam masala powder and salt and cook for 3-4 minutes. Now add some water if the masala is too dry. Add the boiled eggs and 2 cups of water and bring the gravy to a boil. 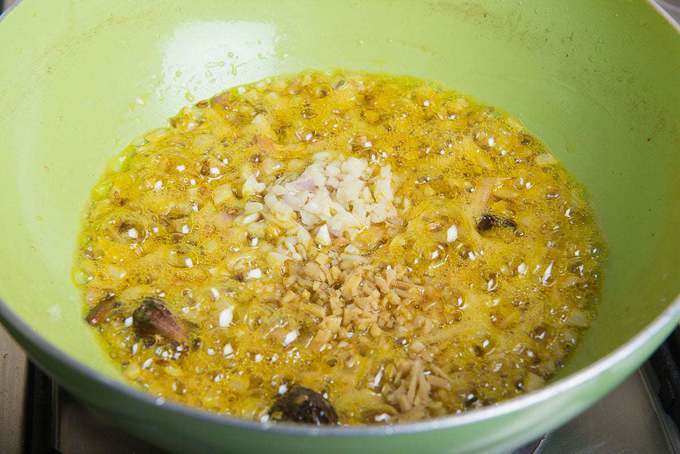 Add kasuri methi and lemon juice and mix well. Serve hot with tava roti or paratha. You might also like these curry recipes. thanks for sharing delicious egg curry recipe with us.